SEA (Student Education Association) students filled backpacks with supplies to send to school children in Chimbote, Peru. Students in Chimbote are not able to attend school if they cannot provide all of their own supplies – and the list of required materials is quite long. SEA students, some who have been to Chimbote for a January course, purchased supplies for three elementary and four secondary students. 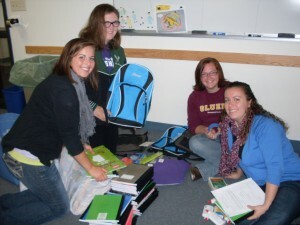 The backpacks will be shipped to Peru by the foundation that supports the Mission where the students stayed in January.